There are 23 intervertebral discs within the spine and over time, due to unbalanced pressures, herniation can occur. These intervertebral discs consist of a gel-like elastic core (nucleus pulposus) and a surrounding ring (annulus fibrosus). This ring holds the inner core together and prevents it from being extruded. 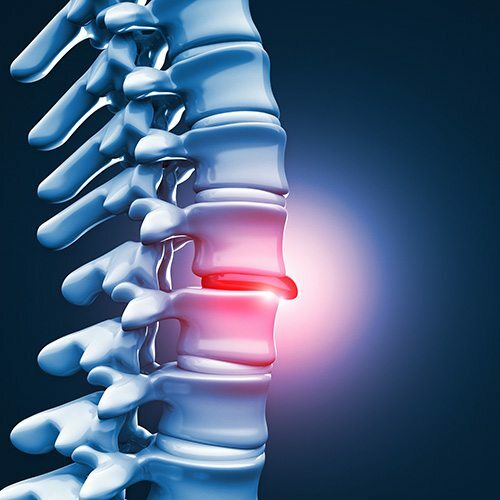 The construction of the intervertebral discs is designed to absorb pressure and function as “shock absorbers.” But due to aging, overload, incorrect posture, weak back or abdominal muscles, obesity, or hereditary deformity, herniation can occur. When herniation occurs back pain, with or without radiating pain into the legs or arms, is the most common symptom of a herniated disc. And in addition to a clinical diagnosis, a herniated disc can be confirmed by MRI or CT scan. Surgery should be as gentle as possible. This minimally invasive approach allows surgeons to work with technically sophisticated instruments and devices while operating through a 7mm incision. If you are considering a non-invasive method for your herniated disc, send your MRI to Minnesota Spine Institute for a FREE review and consultation. During surgery, the patient lays on their side or stomach. After the incision is made, a channel is made to the source of the pain–the herniated disc. Without any cutting, surrounding tissue is gently moved aside and a natural opening (e.g. intervertebral foramen or interlaminary fenestration) is used to access the vertebral canal. The surgeon guides a specialized endoscope to the spinal canal and the herniated disc material is carefully and gently removed using small forceps and other special instruments. Upon completion, the surgeon will make sure that the affected nerve fibers are moving freely and the instruments will be removed. The small incision will be closed with a few stitches and covered. Since the pressure on the nerve is removed, the patient is normally pain-free right after surgery. Upon doctor’s orders they are able to return home and resume normal activities later that day. Most herniated discs do not require surgery. Surgery should only be considered after conservative treatments, physical therapy, and heat and pain medications. Although no one likes the thought of surgery, for certain patients, it is the only chance to rid themselves of their symptoms and regain their quality of life. For minimally invasive solutions and leading treatment options, contact Minnesota Spine Institute today. Previous Do I Suffer from Failed Back Surgery Syndrome (FBSS)?